Bernard Tomic has found form in France. BERNARD Tomic is one win away from reaching a claycourt tour final for the first time. 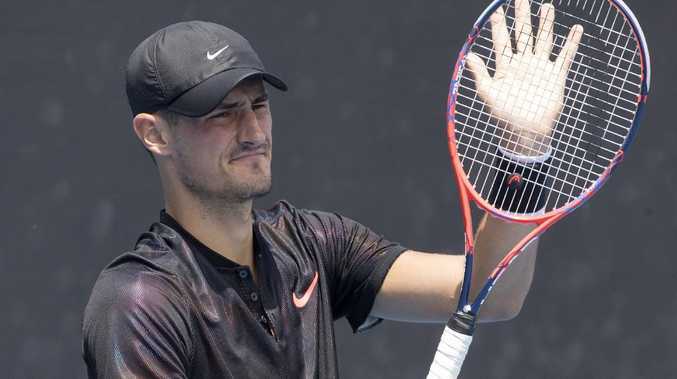 Tomic's 6-3 6-4 victory over Italian qualifier Gianluca Mager has thrust the 25-year-old into the semi-finals of the Open du Pays d'Aix Challenger event in Provence. The $200,000 tournament in France is providing Tomic with priceless match practice and rankings points as he battles to revive his once flourishing career. The former Wimbledon quarter-finalist and world No.17 has plummeted to 243rd in the rankings after a disastrous 2017 season and four-month winless run in 2018. But with three straight wins, on his least preferred surface, for the first time since 2013-14, Tomic is displaying a newfound resolve. He could face fellow Queenslander John Millman in the final if he beats Swede Elias Ymer next up. Top-seeded Millman routed German Oscar Otte 6-0 6-0 in his quarter-final and plays Argentine Guido Andreozzi for a place in the title match.